Are wearable activity monitors equivalent to professional health advice? Wearable tech is all the rage right now, with Google Glass and now the Apple Watch being gadget fiends' latest must-have items. Electronic activity monitors may be the most popular example of health-monitoring wearable technology. A new analysis from researchers at the University of Texas Medical Branch at Galveston - published in the Journal of Medical Internet Research - compared 13 of these devices. "Despite their rising popularity, little is known about how these monitors differ from one another, what options they provide in their applications and how these options may impact their effectiveness," says Elizabeth Lyons, senior author of the new study and assistant professor at the Institute for Translational Sciences at the university. "The feedback provided by these devices can be as, if not more, comprehensive than that provided by health care professionals," she adds. Lyons and her colleagues assessed 13 wearable activity monitors available on the consumer market. The team wanted to see how the devices may promote healthy and fit behaviors and determine how closely they match successful interventions. The researchers also compared the functionality of the devices and their apps with clinical recommendations from health care professionals. In their analysis, the researchers write that most of the goal-setting, self-monitoring and feedback tools in the apps bundled with the devices were consistent with the recommendations health care professionals make for their patients when promoting increase in physical activity. Interestingly, though, the authors suggest that the apps with the most features may not be as useful as apps with fewer - but more effective - tools. The researchers also consider that how successful any monitor is largely depends on matching individual preferences and needs to the functionality of the device. For instance, someone who gets most of their exercise from swimming will benefit the most from having a waterproof monitor. Applications for activity monitors beyond aiding weight loss? The report also contains suggestions on applications for these monitors outside of their typical role as weight loss aids. For instance, the researchers suggest the wearable activity monitors could be useful for patients who have been released from the hospital. These patients could use the monitors to measure their recovery and quality of life. Also, health care professionals could use data from the monitors to identify at-risk patients for secondary prevention and rehabilitation purposes. "This content analysis provides preliminary information as to what these devices are capable of, laying a foundation for clinical, public health and rehabilitation applications. Future studies are needed to further investigate new types of electronic activity monitors and to test their feasibility, acceptability and ultimately their public health impact." The study only looked at devices compatible with personal computers and iOS mobile devices, and the researchers admit it is possible "the experiences of Android users may differ from our experiences." Here's a light-hearted look at cancer treatment from the point of view of my son Elliot, who was only 4 1/2 when he was diagnosed. I know many of the adults I am in touch with who have cancer or who are helping a person with cancer through this journey, will relate! 1. It is perfectly acceptable to have a complete tantrum and throw your shoes around just before leaving for the hospital. 2. You always deserve a present after chemo. 3. If you feel like showing more respect and politeness to the hospital clown than your oncologist, that's OK.
4. If you manage to grab the syringe of medicine from the nurse, it's their loss and you are then allowed to squirt its entire content around the room. 5. You are allowed to complain loudly about any smells like perfume, but you are also allowed to fart freely whenever and wherever you want. 6. Anyone who says "this one tastes like syrup" better be not be lying or they can expect to catch some spit. 7. You are allowed to worry about life and death, but only to the same extent that you worry about whether Santa Claus will be able enter your home if you don't have a chimney. 8. Speaking of worry, you are not allowed to worry about anything that is not going to happen today or tomorrow. 9. Any bad thing that happened in the past should be quickly erased from your mind using ice cream. 10. It's OK to throw up directly on your caregiver instead of into the bucket they are holding. It will create warm and funny memories for them once this is all over. 11. Good friends may stare when they first see you without any hair, but they are quickly more interested in all your new toys. So make sure you have lots of new toys around all the time. 12. It is the right thing to do to jump off the examining table if the doctor's hands are too cold. 13. A popsicle for breakfast is a good idea and goes well with bacon. 14. If someone rubs your bald head and says you're cute, you should stare at them in complete boredom until they stop. 15. Always believe that scars are badges of courage and make you look like a pirate or a superhero. 16. Jumping on the bed is a perfectly acceptable form of exercise. 17. Someone should always be available to carry you if you don't feel like walking anymore and they will be grateful if you look at them lovingly and say, "You're walking too slowly." 18. It's a good idea to frequently press the little button next to the bed that makes the nurse come running, because she might be lonely and bored and enjoys picking your crayon up from the floor. 19. The only part of hospital food you should eat is the dessert. The rest is not really food, anyway. 20. Make having fun your priority all the time, no matter where you are or what's going to happen next. The day has finally come: You’ve graduated from nursing school, passed the NCLEX and finally landed your dream job. Now comes the tough/awesome/rewarding part—actually working as a nurse! When you’re just starting out, it can be tough to know who to listen to and what advice is actually relevant to you. So we asked our Facebook fans for the number-one thing they’ve learned on the job as nurses. Check out their smart, funny and inspiring responses—then let us know what you’d add to the list. 1. Never pass up an opportunity to eat or pee. 2. You can have a nurse title if you pass state boards, but you can only be a real nurse by having empathy, compassion and treating your patients as individuals—not room numbers or bed numbers. They are humans with their own souls. 3. If it’s open, it could squirt. 4. Never underestimate the value of listening to a patient and their troubles for a few minutes. Sometimes your ear can make all the difference in somebody’s day, year, situation or sleepless night. 5. Nursing is 10 percent skill and 90 percent communication. 6. Stay calm and don’t panic—98 percent of what you do can’t kill or hurt anyone (I got this piece of advice from a 35-year vet nurse who was my proctor on my first day!). 7. Never, never, ever assume ANYTHING! 8. A little teamwork goes a long way! 9. Always be an advocate. Never be afraid to speak up for your patients’ best interest! 10. Don’t take life for granted. Stop and smell the roses. Enjoy the simple things, like the ability to take a shower or the human touch. What’s the number-one lesson you’ve learned as a nurse? How do you approach continuing education? Do you seek out courses that will truly enhance your skills as a practitioner? Or do you simply look around a week before the renewal deadline and pick an online course you think you can complete in a short amount of time? Is price a deciding factor for you — getting the most hours for the lowest cost or only considering courses offered for free at the most convenient facility? Because the Board of Registered Nursing certifies course providers, not individual courses, the key is to look for a good provider, either one you know from past experience or one that comes recommended. Courses generally need to be related to either direct or indirect client or patient care, like patient education strategies, cultural and ethnic diversity or skills courses like stoma care. Indirect patient care may include courses in nursing administration, quality assurance and nurse retention, as well as instructor courses for CPR, BLS or ALS. Online: There are wonderful online companies that offer excellent material and the advantages of time flexibility and low cost. California is very generous in allowing all 30 required hours to be completed online; not all states are as accommodating. Almost every online course offers the option of a hardcopy text if you want it, and buying one for a few extra dollars is a good, inexpensive way to build up a reference library. Many online courses also offer the option of retaking the final test several times over a lengthy period (although I have never come across a continuing education test that was even remotely difficult). Several courses also offer a webinar component that allows for greater participation. Virtually all professional organizations offer online courses to their members. Fun classes: Some courses promise entertainment, as well as education. Trips to resorts and cruises come to mind, offering sun, scenery, shows and good food — and learning, to boot. Who wouldn’t like that? This is, of course, the most costly option you can choose, but it might be a good way to combine work with pleasure. 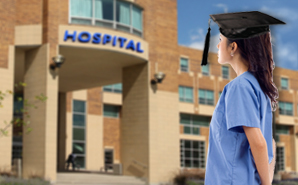 Your employer can be a very good source for a wide variety of continuing education programs. These courses are often free to employees and inexpensive for others. Sometimes sponsored by medical equipment vendors or drug companies, many classes of this type are short-term and highly specific. Very often, supervisors are quite accommodating about scheduling if the class is offered in-house — especially if the class is directly related to the care you give. Cross-disciplinary offerings are frequent in hospital settings, and as long as the class is Category I, you can even take courses directed at the medical staff. Nurses often make the mistake of thinking that if an instructor is local, he or she has nothing useful to say. But you might be surprised at the credentials of some of your fellow employees. Both day-long and short lunch-hour seminars can be a boon to your professional development and easy ways to rack up the CE hours. • You cannot take courses designed for nonprofessionals or that focus primarily on self-improvement, like weight reduction or yoga (although some stress-management courses are allowed). • Providers cannot allow for partial credit, although it is acceptable to break up multiple-day seminars into separate offerings, each with separate CE hours. Staying for only half the day will not cut it. • If you take a course in California, it must have a California BRN provider number. If taken out of state, courses offered by the American Nurses Credentialing Center are acceptable, as are out-of-state courses offered by providers approved in another state — as long as the course are taken outside of California. • Advanced degree candidates: If you are in the process of obtaining a higher degree, you can count some of your academic courses toward your CE requirement using the following equation: one semester unit equals 15 CEUs, one quarter unit equals 10 CEUs. • Hardship or disability: You may also be excused from some or all of your continuing education requirement if you can prove a personal hardship, such as a physical disability last more than a year, or if you are solely responsible for a totally disabled family member for more than a year. • Practicing outside California: If you are employed by a federal agency or in military service and are practicing outside of California, you can maintain your license without CEUs (although those organizations usually have their own requirements). Not working right now, but want to maintain an active license? You will need the CEUs, just like everyone else. But you can also choose inactive status; if you go on inactive status and then resume active status within eight years, you will only need 30 contact hours in total to be reinstated. Don’t forget: It is not enough to take the course and earn the hours. You must retain proof of completion for at least four years, just in case you are one of the randomly selected ­­­­­­nurses whose CEUs the BRN decides to audit and verify. Whatever your individual circumstances, don’t waste this opportunity for career growth. Choose your courses wisely and try to avoid having to select your CE hours based on expediency. This is the only post-licensure education some nurses will receive. Get as much as you can. 2. Maybe eat lunch or go pee…those are always nice. LOL! 3. We adopted a five-second dance-off at the top of the hour. Regardless of what you’re doing in the ER, when the music comes over the intercom, you have to stop and break it down! Doesn’t go over well with the director, but what he doesn’t know…and it really works! 4. I use my break to call the ones I love. My husband and my mom are great for reminding me why I do this job. My mom—one of my favorite people to call—is also a nurse, and has done three deployments in more than 25 years of military nursing. If I think I’m having a bad day, I know for sure she’s gotten through worse ones, and she gives great advice. A little perspective goes a long way. 5. Hand puppets. Life is better with hand puppets. Seriously. They make you laugh. 6. Sometimes I look at job listings for positions outside of the medical field. Every time I read them, it reminds me I would never, ever make as huge an impact on anyone’s lives like I can in nursing. 7. I’m gonna go with “drink.” After work, of course. 8. As corny as it is, I go into the bathroom, stare at myself in the mirror and start making funny faces. Gives me a chance for a breather, and hey, if you can’t laugh at yourself, then who can? 9. We send jokes to other departments via fax or tube system to try to brighten someone else’s day. It’s very rewarding. 10. I remind myself that if I’m having to nurse someone for any reason, they are having a worse day than I am. A smile goes a long way, and seeing and making someone else smile ALWAYS makes me feel better…and them, too!